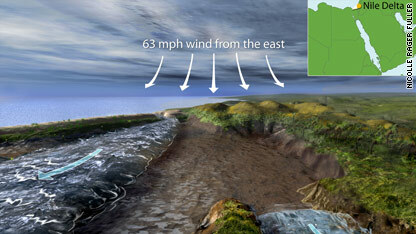 An illustration based on new research shows how wind could have moved and split waters from two ancient basins. The parting of the waters described in the book of Exodus that enabled Moses and the Israelites to escape the pharaoh's army is possible, computer simulations run by researchers at the National Center for Atmospheric Research and the University of Colorado at Boulder show. The biblical account of Exodus has Moses and his followers trapped by the pharaoh forces against a body of water, which has been translated to both the Red Sea and the Sea of Reeds. In the account, a strong wind comes up after night falls and parts the waters behind the Israelites. Moses leads them into the breach but when the pharaoh army pursues them at daybreak, the gap disappears and the army is lost. Previous research has focused on areas of the Red Sea near the modern-day Suez Canal where the biblical miracle may have been possible. The NCAR/CU team said their research shows those scenarios unlikely. They ran a series of 14 computer simulations to pinpoint the area where the parting of the waters was most likely. Drews conducted the Exodus research as part of a larger project on how winds can affect water depths. It's so awesome that this natural phenomenon happened exactly when Moses needed it to - right after he smote the water with his staff. It's also amazing that the waters went back to the original position and drowned all those Egyptians that were out to kill the children of Isreal! It all happened naturally. God not needed! Thanks for explaining that. considering that there is no evidence to support Jewish slaves to flee with Moses, the story is just a story. If we people want to believe in Fairy tales, that's fine. If you are trying to change the person's mind from believing in fairy tales, you are more nuts than the believer. Wiccans believe in just as many Fairy tales as any other religion. I mean c'mon they serve mythological type of gods and goddesses. That's the pot calling the kettle black. People should believe or not believe in what they want. The beginning of wisdom starts with the fear of God. The bible says so. So for all the brilliant people out there who does not belief in God, I pray that he has compassion on you! Read the bible, look at what is happening in the world and so figure! My God is awesome! Next: a scientifically plausible model of Santa's sleigh. We're children, still, after thousands of years of civilization, and we love our fairy tales. Gods, Moseses, Jesuses, Santas, tooth fairies, monsters under the bed. Anything but dealing with reality. Amusing and a bit sad. A long time ago a tornado scooped up a reindeer family, a sleigh and a fat farmer taking out the garbage in a hefty bag, and it looked like flying reindeer bringing presents. Christians often don't like science till it helps them make their fairy tales more real. It as an interesting read and theory and opens a good debate. Now explain the lady that turned into salt at Gomorrah, or Lazarus. In response to ftaco2004, I wish more people would have open minds like that and look at things in different points of view. They discovered years ago that it was a mistranslation. It wasn't the Red Sea, it was the Sea of Reeds. That's, of course, if it even happened at all. The waters did part for Moses but it was all done by UFOs. Ask Lady Gaga! She knows EVERYTHING! I'm going to go over there and set up two fans on each side of the waters to see if I can part the waters as it is said he did. Anyone wanting to help can bring a few thousand extension cords and of all things, some drinking water. Try using a leaf-blower, it might work better than a couple of fans. It's on any GPS, just punch it in under "landmarks". This is silly. There is no historical evidence that a Moses existed or an Exodus took place. The Old Testament is a charming fairy tale that has inspired many people it's silly to take it as historical truth. What kind of a god would tell a man to kill his own son? What kind of a man would agree? Times change, gods change and consciousness changes. Time to grow up.